Mockup templates remain hands down the best way to show off your design work. They are proven to increase the perceived value of your end designs. However, creating your own mockups and presentations can be incredibly costly and time-consuming. 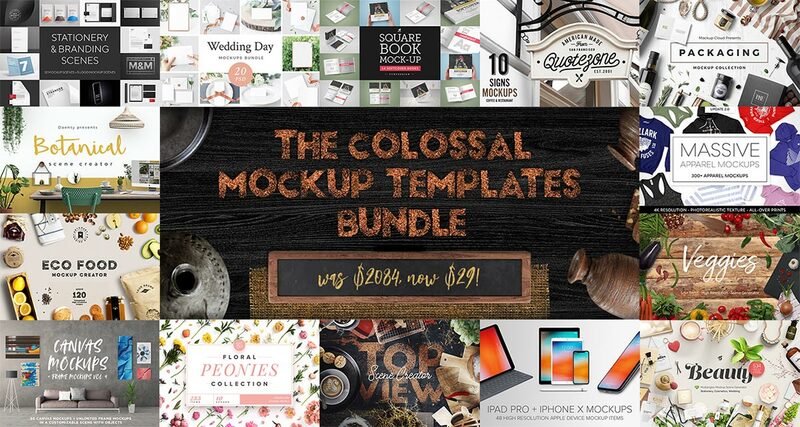 Save yourself time and money by unlocking 170GB of premium quality mockup templates with this unbeatable value collection. There’s so much variety you’ll be all set to mockup any of your projects – from branding and packaging to print and apparel. Save over $2000 with the 99% discount, which reduces the price to just $29. The Colossal Mockup Templates Bundle contains 15 best-selling products that allow you to simulate your designs on a variety of objects, or within themed scenes with complementary items. At their regular price this collection would cost over $2000, but for a limited time you can download them all for just $29. Extended licensing for every product is included in this price too, which gives you the freedom to use all the resources in your commercial and client projects. So helpful post for me. In this post, I learn a lot many many thanks for sharing with us. Wonderful, really a helpful article with all the information at once place. Hey, it will be a cross checking list for me to save bucks by the way. Would like to learn more from you; really helpful dude.